The makers of the popular Clash of Clans game released Clash Royale for Android and iOS a few weeks ago, a new real-time strategy game that given the enthusiastic welcome it received, might surpass its older relative in the charts very soon. I enjoy playing it very much, but I also know things can be somewhat confusing when you’re new to the game so I made a Clash Royale guide to help you out. The game borrows a wealth of concepts and elements from the Clash of Clans universe, such as characters, troops, elixir, and gold and mixes things up with an addictive combination of card-collecting and real-time strategy. As fun as it may sound, Clash Royale is not just a simple time-waster so if you’re still trying to figure out its ins and outs, continue reading. We’ll lay out the basics below to help you get started. During a Clash Royale battle, each card you use can play one or more roles. As always, some are better than others and this also depends on how you build your deck (more on that later) but for now, I’ll just go through all the types of cards available in the game. Tank cards – These cards offer a building or troop with high HP, usually 800+. You need these in your defense as they can take a lot of damage and keep your lower HP troops alive for longer. Single DPS cards – This type of card has high single target damage and is essential to eliminate powerful opponent towers and tanks. Some of my favorite are the Prince, the Balloon, and the Barbarians. Splash cards – As the name suggests, these cards can damage multiple targets at once (also known as splash damage). Some of them are troops like the Valkyrie while others are spells such as the Fireball. Air target cards – They can give you either spells, troops or buildings that can attack air units. You absolutely need to have such cards in your deck since at higher arena levels you’ll have to deal with flying troops more often. Flying cards – These give you flying troops and they can be very useful as only air target cards can damage them. Spell cards – These cards will give you spells you can use anywhere on the map. When used wisely, they can be a powerful weapon. Defensive cards – The defensive buildings offered by these cards can be used to protect your towers, but there are also some for pushing in your lane. If you ever played Hearthstone or a similar game before venturing into the Clash Royale universe then you probably know how important it is to get to know the cards available in the game when it comes to deck building. Before deciding if you include a specific card in your deck, there are lots of factors that need to be taken into account, but to keep things simple, the two basic ones are its damage and elixir cost. Some cards work very well with one another, so as you’re getting to know the cards better you will find various synergies that can be very powerful in certain situations. There’s no way of finding out which cards work together other than experimenting various combinations. However, don’t make drastic changes to your deck if you want to see the effect of a particular card combo. Perform small changes to the deck so you can easily see their effect during battles. Also, the safest option is to test new decks in training battles first – when you lose PvP battles, you’ll also lose trophies so you don’t want to lose more games than you have to. As you acquire more trophies, you’ll advance to higher leagues or arenas, get higher quality chests and other goodies. If you’re obsessing about some specific card types, you’d better stop soon. The best decks are balanced, meaning they include various types of cards, from all elixir cost tiers. You can easily see the average amount of elixir your deck costs by simply tapping on the deck (this information is displayed in purple). As a general guideline try to keep that number between 3.5 and 4.5. You’ll need a bit of luck during battles since the hands of cards are dealt randomly. If your first hand is weak, adopt a defensive strategy. Allow your opponent to attack first and focus on building more elixir. This will also let you see the tower he’s targeting so you’ll know which one needs defense. While the above structure contains more than 8 cards, let’s not forget a large number of cards can be used for multiple roles. So keep that in mind when you’re selecting the cards to ensure you fill in all the roles to build a strong, versatile deck right from the start. Sometimes it’s OK to hold back – Elixir is a precious resource so there’s no need to wasted by attacking every incoming troop. Save enough elixir to deploy a few cards (using synergy is also a good idea) to make the spent resources worth more. Also, keep in mind that many enemy troops will be quickly killed by your tower so you don’t have to launch attacks on them. Use your elixir to push on your opponen’t tower instead. Be very selective with upgrades – It sure seems nice to have all your cards upgraded but it’s not easy to earn gold, so you can’t spend it like crazy. The best strategy is to upgrade the most common cards since that costs less gold and prioritize upgrading the cards you use most often. As you play the game, you’ll get more chests regularly as well as after each victory, so you can start upgrading more cards later. 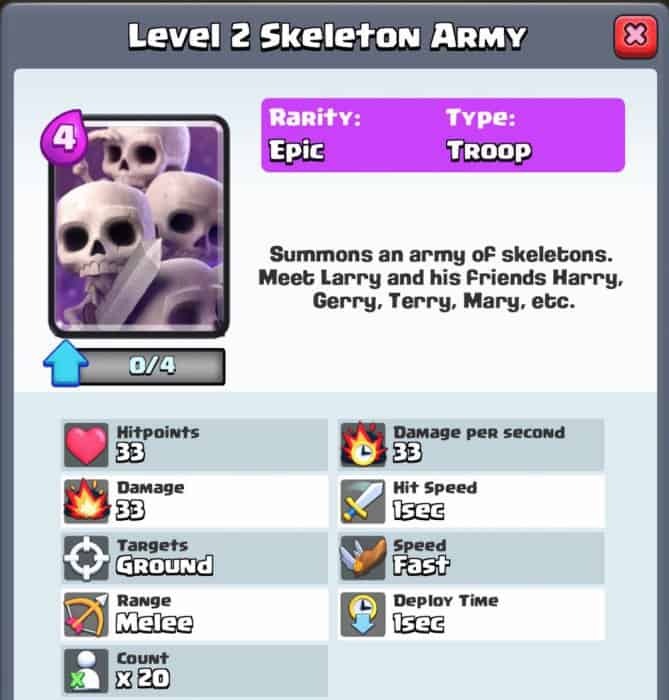 Use Skeleton attacks – There are several types of Skeleton troops, although only the Giant Skeleton is robust so to speak. The rest will easily take damage and die just as fast, but they can be used as a distraction before you deploy tank troops so they won’t take most of the damage. Use the kill zone – Even if you have some strong offensive cards in your hands, your defense still matters and without a proper one, the chances of winning the battle are significantly lower. As a beginner you’ll need to leverage the kill zone – the center area on your side of the field. Don’t intercept incoming attackers at the bridge, wait for a few seconds and place some fast troops in the middle of the kill zone. This is a great way to prevent attackers from reaching the tower they were targeting as the arrows and cannon balls from the towers will start hitting them. Before you play a card, consider the consequences – It’s easy to get carried away in the heat of the battle, but it doesn’t mean it’s the wisest course of action. Think for a second before you’re about to deploy one or more cards as to how they will affect the course of the game. Even toward the end of the game when elixir replenishes faster, analyzing each step in advance will inevitably help you play better. Counter your opponent’s actions – To do this, you’ll obviously need to allow your opponent take action first and then choose your strategy accordingly. Whatever card he deployed you can use one to counter it. For example, if he deployed flying troops you can use an air target card to attack them. Also, try to get the fight close to your tower so it can assist you but not that close that it will take damage. Allow your opponent to attack first – Of course, this is not always possible, but you should try to do its as often as you can. This gives you extra time to fill the Elixir bar and come up with a solid strategy based on your opponent’s actions but also save important cards for late-game when you need to gain the upper hand in order to win. Use your elixir wisely – If you know the troops you’re about to deploy will simply get obliterated without serving a useful purpose, there’s no point on wasting elixir on this. To manage your elixir effectively, you’ll also need to consider which troops in your hand can be used alone (and their costs) as well as the possible card combinations. Keep a splash card on hand at all times – You’ll never know when your opponent is about to launch an army so having a splash card ready can be a life saver. You can use one card to get rid of troops from multiple cards, so it’s definitely worth using it at the right time. There you go! 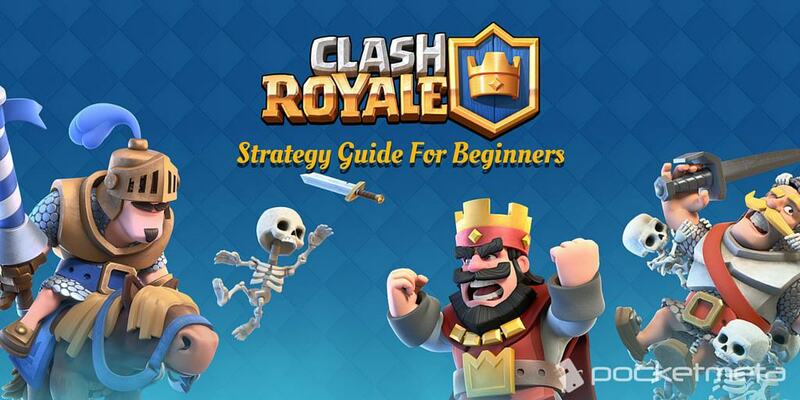 Hopefully, our Clash Royale guide will help you get more wins and progress to higher-level arenas in the game. Even if you’re having a hard time defeating your opponents at first, be patient and give yourself some time to become accustomed to the game’s mechanics. Follow us on Facebook, Twitter or Google+ to stay up to date with the latest apps, games, guides and everything Android, iOS and Windows Phone.